Social phobia is often described as fear of public situations and scrutiny which leads to embarrassment or humiliation. When you have social phobia you may have extreme feelings of self-consciousness built into powerful fear. Physical reactions such as blushing, sweating or trembling can make public situations worse. See below for information on how we can treat social phobia by endoscopic sympathetic block (EBS), and on different types of social phobia. In the last 10 years, Sympatix surgeons have treated over 2,500 patients using ESB with an excellent success rate. 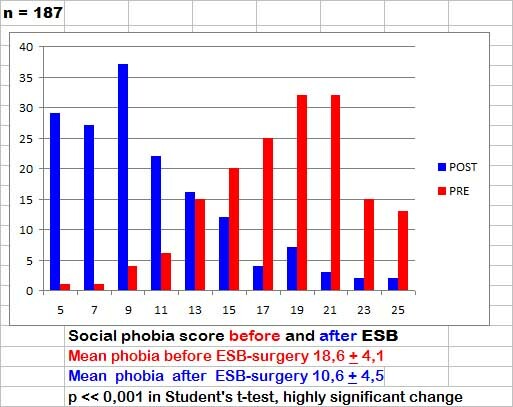 Results of social phobia treatment with ESB are shown in Figure 1 below. The basics of the treatment of the various forms of social phobia by ESB can be read in our fundamental study . 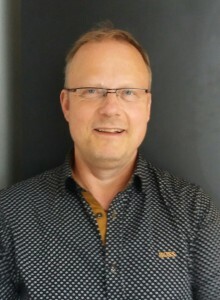 A study of 160 patients also showed clear overall satisfaction of ESB patients operated by Sympatix (Privatix) (Pohjavaara P, 2004.). These results were confirmed by a long-term study (Rantanen and Telaranta, 2013) which showed a high level of patient satisfaction which persisted long-term. The results of this study of 187 patients demonstrated a significant relief in both the physical symptoms – mainly blushing, sweating, heart racing, and trembling – and the psychological feeling of anxiety. As might be expected, treatment of social phobia by ESB can improve the quality of life. Can be thought to have developed following strict discipline, high expectations at home or at school, and possibly parental undervaluation of the child, these being only examples not by any means accusations. Such an adolescent and future adult wants eagerly join the social company of the others, but finds it embarrassing due to lack of self-esteem. He/she often blushes, but does not sweat markedly. An ESB procedure results in effective relief from conflicted type social phobia. Can be thought to have developed following isolated home environment and lack of social contacts. He/she does not necessarily blush, but avoids company and eye contact, likes to isolate and hide. An ESB procedure may may result in effective relief from withdrawal type social phobia. This can be confirmed with a temporary stellate ganglion block performed before the surgery.